Silver 140mm fan guards / grills for use with 14x14cm case fans. These wire-formed fan guards provide extra safety for your fingers. Applications: You do not need to use the hand guard if the case fan is installed inside the case without exposing the fan blades. It is however suggested to mount the case fan with this hand guard if fan blades are exposed to the outside of the case. This is particularly true if you plan to drill holes (blowholes) on the side or top panels of your case to mount additional case fans for overclocking purposes. Popular for case mod / modifications. 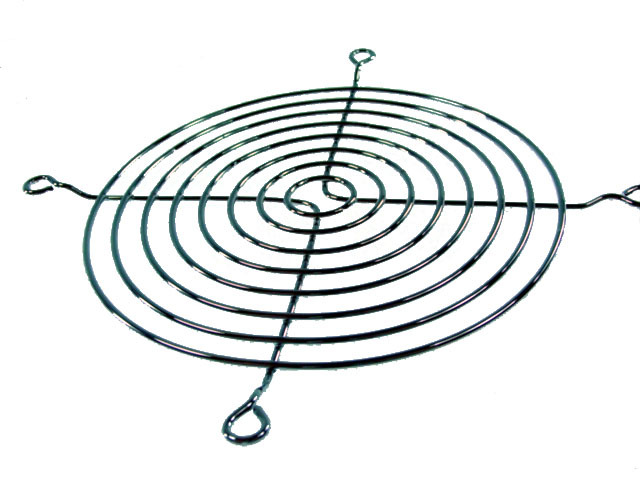 This fan grill is also useful as replacement of damaged or missing ones in a power supply and other devices. Specifications: Works with most 140mm case fans. Actual distance between adjacent mounting holes: 12.5cm.